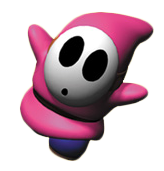 This is a gallery of images featuring Shy Guys. Yoshi handing out presents to a Shy Guy. This page was last edited on April 16, 2019, at 10:49.